Saudi Crown Prince Mohammed bin Salman attends the Future Investment Initiative conference in Riyadh last month. "We are returning to what we were before — a country of moderate Islam that is open to all religions and to the world," he said at the economic forum. 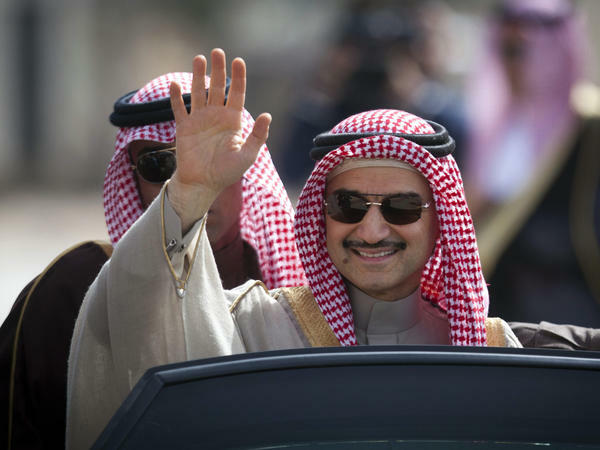 Saudi billionaire Prince Alwaleed bin Talal waves in the West Bank city of Ramallah in 2014. He is among dozens of Saudi princes and former government ministers arrested over the weekend as part of a sweeping anti-corruption probe, further cementing King Salman and his crown prince son's control of the kingdom. The Saudi prince behind the weekend's unprecedented arrest of high-level Saudi officials and businessmen is known as young and brash, and has even been called reckless. He is also known to be in tune with Saudi Arabia's youth; those under 25 make up a majority of the country's population. The prince's latest high-risk move has gotten rave reviews from Saudis on Twitter, the country's most popular social media outlet. 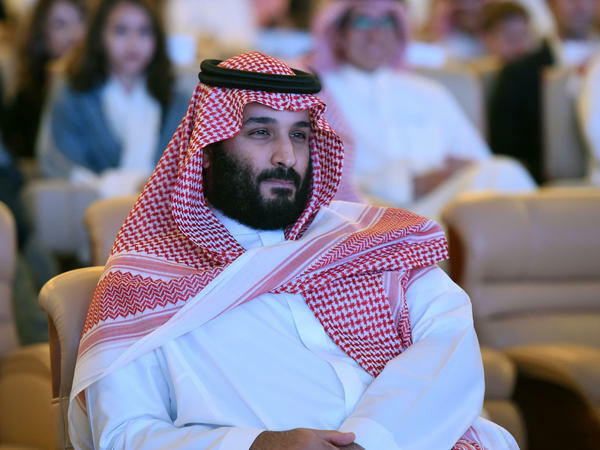 Crown Prince Mohammad bin Salman, or MBS, as the 32-year-old leader is known, is gambling that he can modernize the ultra-conservative kingdom by consolidating power and mobilizing a generation of young people, say Saudi analysts inside and outside the kingdom. "Did MBS just pull a red wedding?" asked one supporter on Twitter, comparing the weekend's purge to a bloody family massacre on Game of Thrones. Arrests began on Saturday, hours after the prince was named to head a new anti-corruption commission. The roundup included 11 princes, sitting and former cabinet officials and one high-profile businessman — billionaire Prince Alwaleed bin Talal, one of the world's richest men, who has extensive investments in Western companies including Twitter, Apple and the Four Seasons hotel chain. The detentions were headline news on Al Arabiya, a Saudi-owned news channel. These high-profile targets were previously considered untouchable in the Saudi kingdom and follow other controversial moves, including a royal decree allowing women to drive and limits on the power of the religious police. It does not mean Saudi Arabia is opening up to democracy. The country's rulers are unelected monarchs with a record of jailing critics and members of the Shiite minority. And the purge — action taken by a single leader — is very much in keeping with Saudi royal tradition. But the sweep of arrests marks a change. "It is unprecedented, more for the speed and the scale," says H.A. Hellyer, a fellow at the Royal United Services Institute in London and the Atlantic Council. Mohammed bin Salman is sending a message, he says: "This guy is in charge and nobody is off the table." The crown prince is a Saudi-educated son of the current King Salman bin Abdul-Aziz Al Saud Salman. In a surprise move, he was elevated in June to become next in the succession, replacing his older cousin. "His position is already secure. It's not like he was being challenged. Everyone suspects he will be announced as the new king. But you can always consolidate more," says Hellyer. In one of his first TV interviews after his June promotion, Mohammed bin Salman pledged to tackle endemic corruption in the kingdom. "No one who got involved in a corruption case will escape, regardless if he was a minister or a prince," he warned. It turned out to be no idle threat. "Many of them have been known as deeply corrupt," said a Saudi official who supports the crown prince and requested anonymity to discuss the arrest list — which includes former CEOs of Saudi Telecom and Saudi Airlines, four sitting cabinet ministers and high-profile business leaders from Jeddah, Saudi Arabia's business capital on the Red Sea coast. Some had close personal relations to the crown prince. These high-profile arrests send a powerful message, said the Saudi official. Business as usual is over, he said, with this "shock to the system." It has been shocking indeed in a kingdom used to a glacial pace of change. While Mohammed bin Salman launched the blitz of arrests, he also announced elements of an anti-corruption campaign that appears designed to win public approval, especially among Saudi youth. His anti-corruption commission launched a new probe into an old corruption case involving damage after floods devastated the Red Sea city of Jeddah in 2009. Torrential rains washed away thousands of homes and killed more than 120 people. "No one was held to account there for the damage after the floods," said the Saudi official who asked for anonymity. "Fighting corruption is always popular." The devastation in Jeddah was blamed on corrupt real estate practices and spurred a grassroots political movement that launched the career of a female activist, 38-year-old Rasha Hefzi. She won a seat on the Jeddah local council in 2015, when women could run for office for the first time. The government has announced new trials with as many as 320 defendants, including some already acquitted by local courts. The young prince is dismantling the old Saudi Arabia, says the government official, at least in how it makes decisions. "The consensus-based system is over," he said, referring to Saudi Arabia's traditional governance that involved a slow process of consensus within the royal family. For the hard decisions, "We need the support of the majority of the people," he said. The new populism in the kingdom has the backing of the Trump administration — in particular, Jared Kushner, who reportedly has a close personal relationship with the crown prince. But Mohammed bin Salman is playing a high-stakes game and there are grave risks, says F. Gregory Gause, head of the international affairs department at Texas A&M's Bush School of Government and Public Service. "The biggest risk here is to Prince Mohammad's Vision 2030," he says, a far-reaching reform plan to reduce Saudi Arabia's dependence on oil and diversify the economy. "If some of the leading figures of the Saudi private sector can be detained in this way, it introduces enormous uncertainty into the investment environment," says Gause. "Capitalists do not like uncertainty."